This is not the Arizona law (amended on April 30 after criticism) which allows immigration status be checked only after some other criminal suspicion has been raised and they have reasonable suspicion that the person is in the country illegally. A national Pew poll done May 9 and released May 12 showed broad public support (73%) for the concept of allowing local police to require people to produce documents to verify their legal status. Sixty-two percent approved allowing the police to question anyone they think may be in the country illegally. Colorado Republicans were hoping to retake the Governor’s Mansion in 2010. Governor Bill Ritter was in trouble. He had stumbled politically during his first term when disenchantment with President Obama deepened his problems after last fall’s health care battle. But, the good news for Democrats was that Ritter dropped out of re-election; it made popular two-term Mayor John Hickenlooper the Democratic candidate. The race has remained close between Republican frontrunner Scott McInnis, with the lead exchanging hands, but remaining within six points. 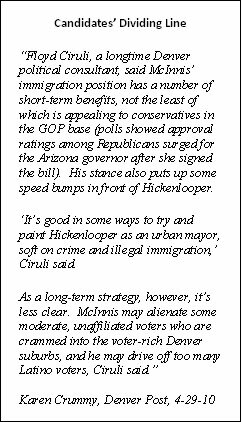 Both candidates are well-known, with only 9 percent of voters not identifying Hickenlooper, but 14 percent unable to rate McInnis on a favorability rating. Hickenlooper’s main political asset is a friendly and positive personality that is well-known in the Denver metro area (about 55 percent of the state’s voters). More than a quarter of voters state that they have a very favorable view of him whereas McInnis has 17 percent of voters in the very favorable category. Democrats are currently running about 5 points or so behind Republicans in the Colorado November election. So, Democrats must run smarter, better funded races. Hickenlooper reported out-fundraising McInnis in the first quarter of the year by about 2-to-1, with a one million dollar haul for the mayor. Republican Senate frontrunner Jane Norton has maintained a consistent single digit lead over Democrats Michael Bennet and Andrew Romanoff since the beginning of the year. Presently, her lead is seven points against each candidate. Norton is 48 percent to 41 percent against Bennet and 46 percent to 39 percent against Romanoff. Considering the general election sample frame Rasmussen uses, Bennet and Romanoff have only been separated by a couple of percentage points. Romanoff appeared to lead the first two months of the year, and is slightly behind today. The shift may reflect Romanoff’s early advantage as a non-incumbent being replaced by Bennet’s recent television advertising. Bennet must have some concern with the fact that after his spending he’s still running behind Norton, who has done little to establish herself as a strong presence in the field. There has been considerable speculation if the national health care legislation that passed last March could be turned into a political asset for Colorado Democrats who voted for it, e.g. Senator Michael Bennet and Congresswoman Betsy Markey. According to recent Rasmussen Reports polls, Colorado voters still oppose the legislation and, in fact, hope it’s stopped as State Attorney General John Suthers is attempting to do with a lawsuit. As the chart below shows, there is very little change in position since the bill was passed. A near majority of Colorado voters strongly favor repeal of the bill. The idea of Suthers’ lawsuit challenging the insurance mandate as unconstitutional has considerable support in Colorado. Forty-seven percent of voters “strongly oppose” the insurance mandate and another nine percent “somewhat oppose” it. Only 25 percent “strongly support” it. Rasmussen specifically asked if Colorado voters favor or oppose a lawsuit to prevent the legislation becoming law and 53 percent favored a lawsuit and 37 percent opposed it. Although jobs and the economy are top worries, the number of people volunteering the deficit as the most important problem facing the country is rising. 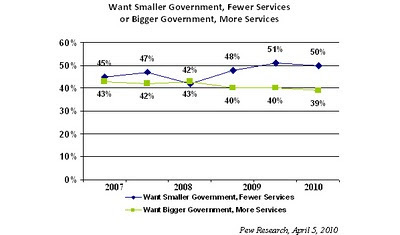 But, government spending is still supported by half the public, especially if targeted to help the economic recovery. Polls show little partisan difference, but Republicans are much more angry about it, and the Republican Party is seen by more voters as better able to handle the problem. A Woman Elected Denver Mayor? In a new piece of analysis in the Denver Post, Floyd Ciruli lists the large number of Denver women executives and politicians who have qualifications to be Denver’s next mayor. The Tea Party is the voter movement that appears to have the best possibility of influencing the 2010 mid-term election. The size of the movement is reported to range from 10 percent of the public made up of those who are actively involved, up to 28 percent who say they support the movement. The core group are mostly conservative (about 70%) and will vote Republican in November. About 60 percent are male and 50 years old or over. Two-thirds have college educations and 40 percent attend church regularly. The issue that appears to motivate them the most is the growth of government and spending as exemplified by the health care debate. They strongly believe the government doesn’t listen. • They are less concerned by social issues. • They more strongly believe the government is moving in the wrong direction and the economy is in deeper trouble than the public in general. Illegal immigration fell off the politically active issue list since Congress failed to pass the Kennedy-McCain immigration legislation of 2007. But, while the issue dropped from view, it didn’t disappear from public conscience. And, the Arizona law activated the nascent passion and political polarization among the electorate and elected officials. Colorado candidates for governor rapidly took predicable positions with Scott McInnis endorsing it and John Hickenlooper arguing it was a bad idea. Colorado last dealt with the issue in 2005-06 with large scale demonstrations, a threatened ballot issue and state legislation to tighten immigration enforcement. A quick Gallup poll conducted last week showed a very high percent of Americans claim to have heard of the Arizona illegal immigration law. Among informed people, 51 percent favor the law. Fifty-six percent of Democrats oppose it, but 75 percent of Republicans support it. Interestingly, the intense interest in the Arizona law happens at a time illegal immigration has declined due to the poor economy and stepped-up boarder enforcement. But, in Arizona, high-profile crime, talk shows and political primaries have kept the issue on the front burner. • Washington once again is receiving its unusual approbation for failure to address the issue. • Democrats, already in trouble in the 2010 election, are anxious not to open a second front of opposition. • Republicans are at risk with the issue too. Not only does the 1994 Republican debacle in California loom large in Republican memory, but Tom Tancredo’s and Bob Beauprez’s use of the issue in 2006 and 2008 were unfruitful. 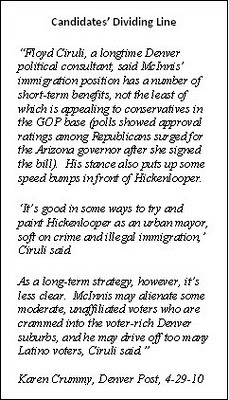 • Arizona is a frontline state where illegal immigration is dominating Senator McCain’s and Governor Brewer’s efforts at re-election and moving them strongly to the right on the issue. • The enforcement side of the issue is dominant and efforts to deal with the 10 million or more undocumented immigrants in the country given short shift. • Interestingly, the grassroots supporters against illegal immigration may preempt the Tea Party for media and public attention. Although there is some overlap among conservative activists, the issue attracts different core constituencies, for example, fiscal and social issue activists. 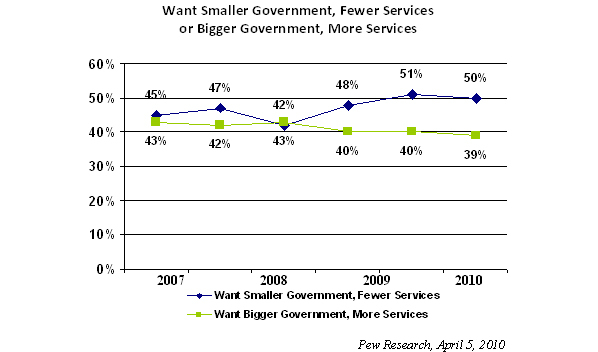 There has been a significant shift in the last year away from a slight plurality of voters favoring more government and services, representing the apex of the Obama surge to a majority of voters wanting smaller government with fewer services.